Yesterday, out of sheer curiosity, I stirred some Swiss cheese, home-grown chives, and store-bought, frozen corn kernels into ordinary cornbread batter. 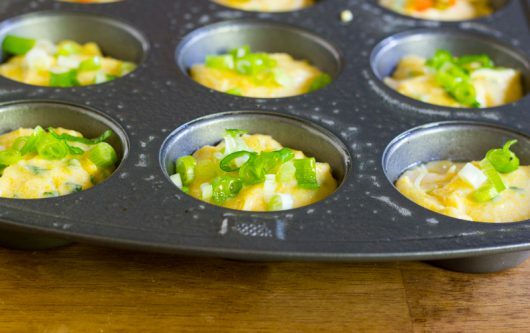 Then I scooped the batter into a standard muffin tin, and scattered the tops with diced scallion and bell pepper. The results of this wild and crazy experiment? The baked muffins looked adorable in their vegetable tiaras. And they tasted like an autumn dream. You might like to make these quick breads, too, and infuse and crown them with herbs and veggies from your own garden or farmers’ market. You can use any cornbread batter you like. Just follow the package directions. 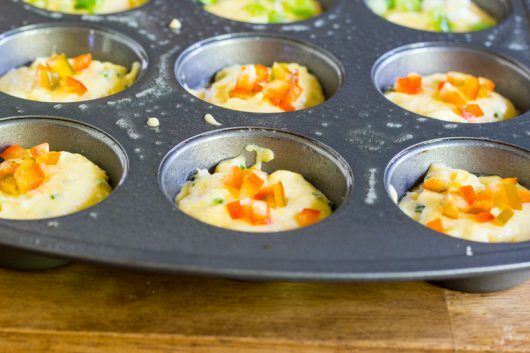 To start, grease a standard-size muffin tin with non-stick vegetable spray. 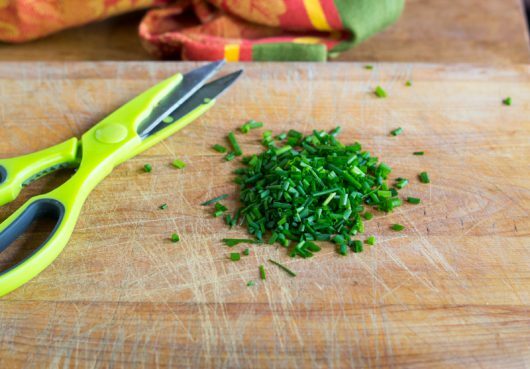 Then dice up some common (not “garlic”) chives — enough to measure 3 generous tablespoons. 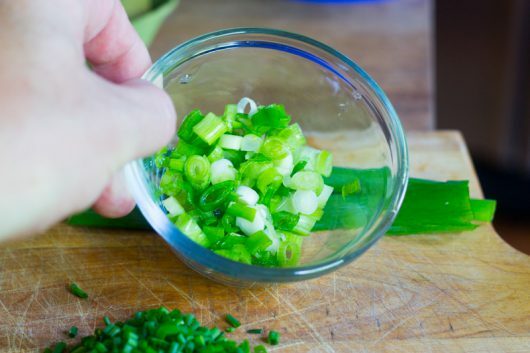 And finely slice the green and white from a particularly handsome scallion. 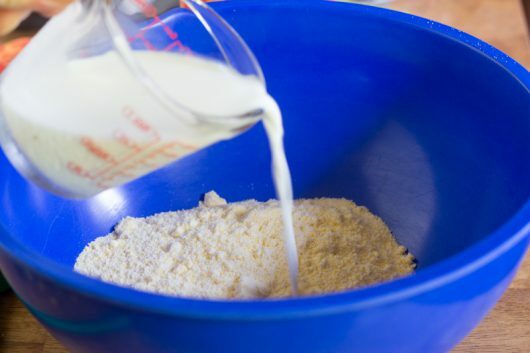 Stir the mixture only until the dry ingredients are moistened. 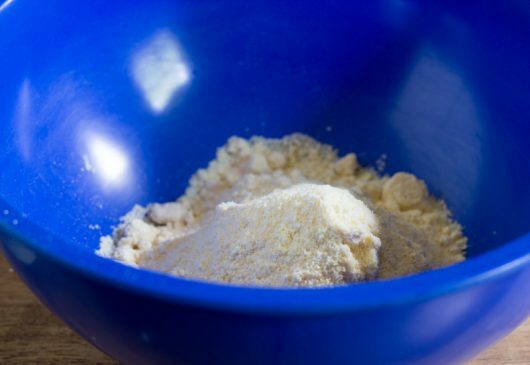 Don’t overmix — the batter should have a few lumps. And 1/3 cup of fresh or frozen (store-bought is fine) corn kernels. 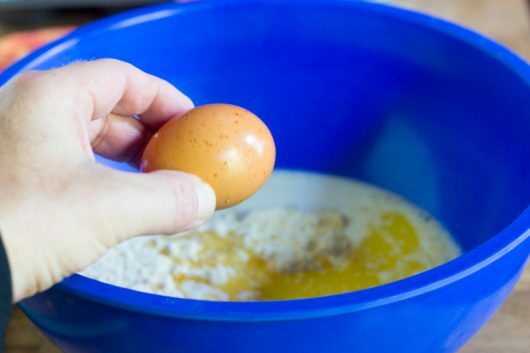 Divide the batter between the muffin openings. 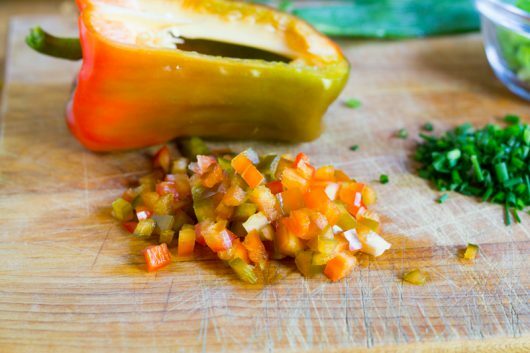 And garnish the remaining tops with the bell pepper. Bake the works for about 25-30 minutes, or until a skewer inserted in the center of a muffin comes out clean. Cool the tin on a wire rack for 5 minutes or so. Then unmold onto a wire rack for further cooling. And serve them with good, softened butter. 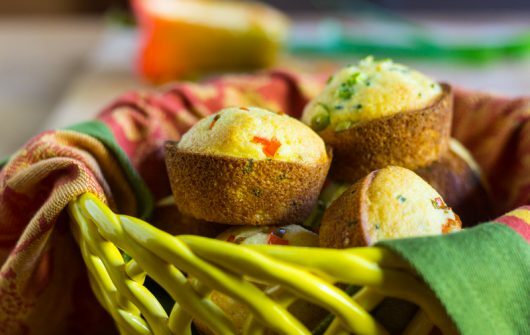 Autumn corn muffins taste as wonderful as they look. I hope you’ll make a batch for your friends and family. Or, just do what I did, and share exactly two muffins with your friend Brenda, and hog the remainder for yourself. Click here to subscribe to my email updates. 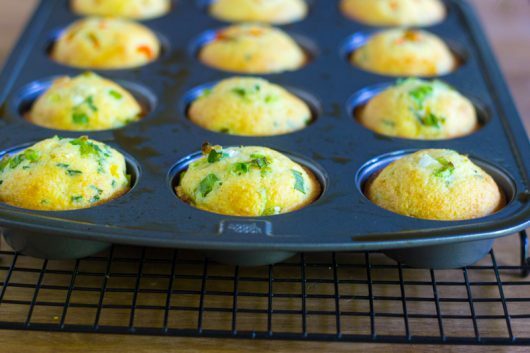 To give common corn muffins an uncommonly delicious taste, infuse them with cheese, chives, and corn kernels. Also, adorn their tops with sliced scallion and/or diced bell pepper. You'll never look back! Center the oven rack, and preheat the oven to 375°F. 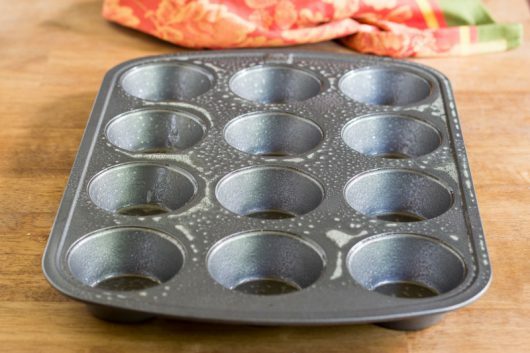 Grease or spray a standard, 12-opening muffin tin. 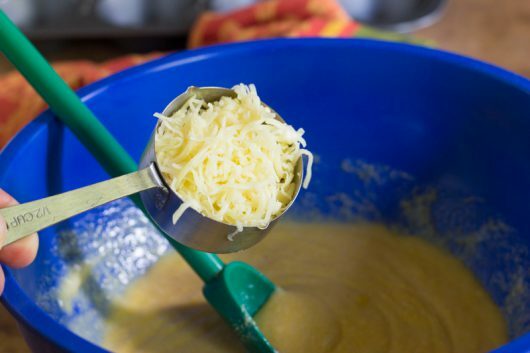 One at a time, stir the cheese, chives, and corn into the already-made cornbread batter. 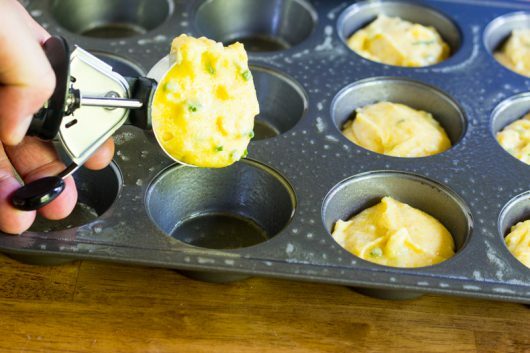 Divide the batter between the openings of the muffin tin. 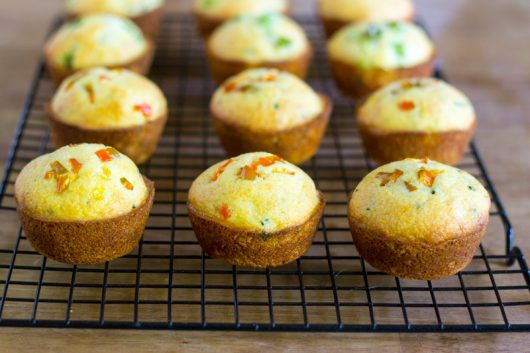 Sprinkle the tops of 6 muffins with the scallions; sprinkle the diced bell pepper over the remaining tops. 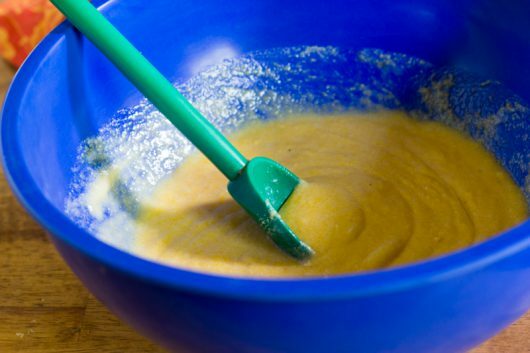 Bake until a skewer inserted in the center of a muffin comes out clean -- 25 to 30 minutes. Cool the tin on a rack for 5 minutes, then unmold, and let the muffins cool on the rack. Serve warm or cold with softened butter. Looks great! I’m thinking a little bit of diced bacon might be a nice addition to the tiara. Hi Jan – Crisp bits of bacon added to the vegetable tiara? I’m in. We’ve all had those dry crumbly corn muffins right? I promise you these aren’t those!!!! The big flavors that these little additions provide will really knock your socks off!! So tasty you may decide to skip the butter!! Perfect balance of sweet corn flavor…and savory pepper/scallion (I had 1 of each!) lovely sharp nuttiness from the cheese…another brilliant idea!! Thanks for sharing Kevin! Hi Brenda – Thanks for taste-testing these veggie-rich muffins! I made this last night, before I read this. Not only did I make some corn and cheese induced muffins, I used the batter and dropped 3 oz dollops on top of an oval baking dish filled with a beautiful pork, black been and roasted poblano chili. Cornbread dumplings. AH-mazing!! 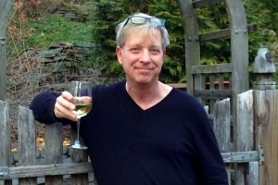 Hi Billy – I love your cornbread dumpling idea! Just know that I look forward to reading your blog. I adore the tours, because of your garden tour, next spring I am attempting a much smaller version of your beautiful herb garden-boxwood hedge and all. Thank you. I am eagerly awaiting your holiday blogs. Just put some frozen corn on my shopping list. Is there a reason I’ve never seen you use garlic chives in anything? Just curious. Your muffins look great. Mine always crumble. What’s the secret? Hi Mary – I once used garlic chives in a recipe, and found the scent too strong. So only common chives for me! These look very good – can’t wait to try the recipe! I might experiment with different cheeses. I have a big hunk of cheddar that is asking to be used in these muffins. Hi Elizabeth – Cheddar cheese will work beautifully in this recipe. Enjoy! How did you read my mind? I had the corn muffin mix out – on the menu for dinner tonight. Your recipe will make them delicious for sure! Your blog puts a smile on my face and makes my week so much better! Thank you! Making these to accompany your Red pepper Soup which I love. Went to the WNC Farmers Market and scored a big basket of the peppers (for $5). Here in Western North Carolina aka Asheville, the Farmers Market is a vast collection of open and closed sheds. What the rest of the country calls the Farmers Market is called a Tailgate Market here…y’all. 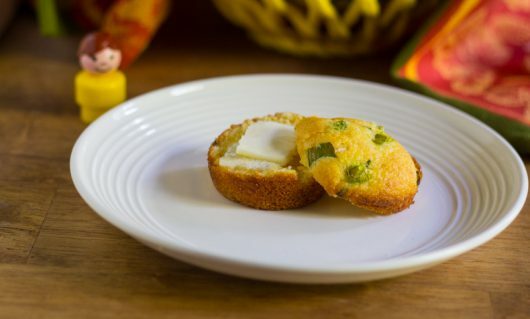 These are really good – mine are too – corn meal, whole kernel corn, milk, little sugar and jalapenos! Mmmm! Oh my goodness, these sound good! Fresh corn, peppers and swiss cheese are wonderful additions. Thanks much Kevin! Cannot wait to try these…they look yummy! I made these autumn muffins last night for my husband’s Birthday dinner. I served them along with a big pot of gumbo and some homemade brownies for dessert. The muffins were delicious! Thank you Kevin for another great recipe. HI Kevin, first time I have ever commented. I love your stuff, and especially indoor and out door Gardening. I have to say I have everything I needed to make these muffins tonight, on a lovely Fall Oregon evening, BUT the cornmeal bread mix!! 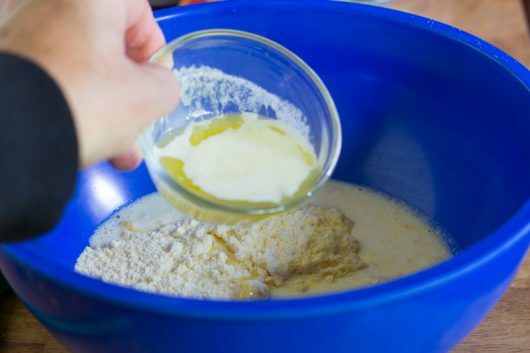 I was surprised you just used a mix and would have preferred you at least would have added a quick scratch recipe for corn bread, since it is so basic and easy. Darn, I will now have to look one up! Heeheehee. hi Kevin… looks yummy!.. 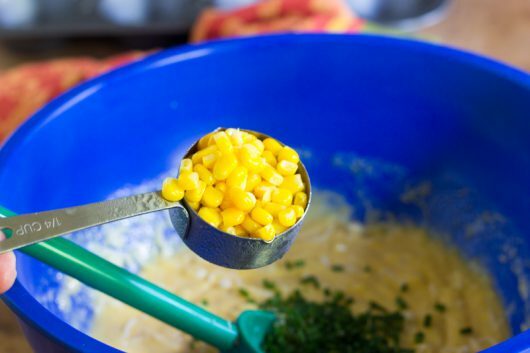 just curious why your video shows you using 1/4 cup corn, while recipe says 1/3.. and which is right? Just wanted to let you know I made these muffins and they were delish Didn’t have the Swiss cheese so used sharp cheddar, but had all the other ingredients to add and use for toppings and I would definitely make them again. Thanks so much for sharing. Hi Maureen Lewis – Music to my ears. So glad the recipe worked out for you! I am definately going to try this soon! I have been making my cornbread by substituting salsa for the liquid called for in the recipe. My Church family loves it. definitely will try these with my next pot of chili……. 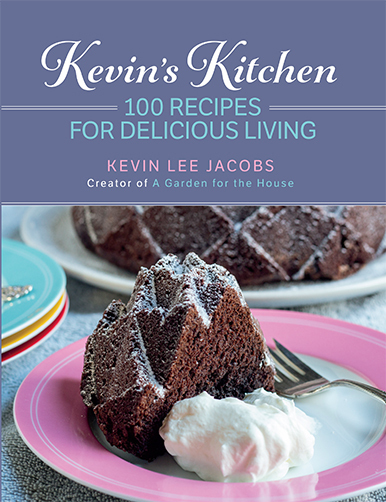 Kevin, you always come up great ideas and I love this idea of how you made the basic muffin way better. It is like a meal in itself, Yum .